I t’s either sweat or rain during monsoon season on Nepal’s golf courses. But, we golfers are a specific sucker-for-punishment breed. Rain, shine, snow, hail; we will keep playing no matter what nature throws at us. 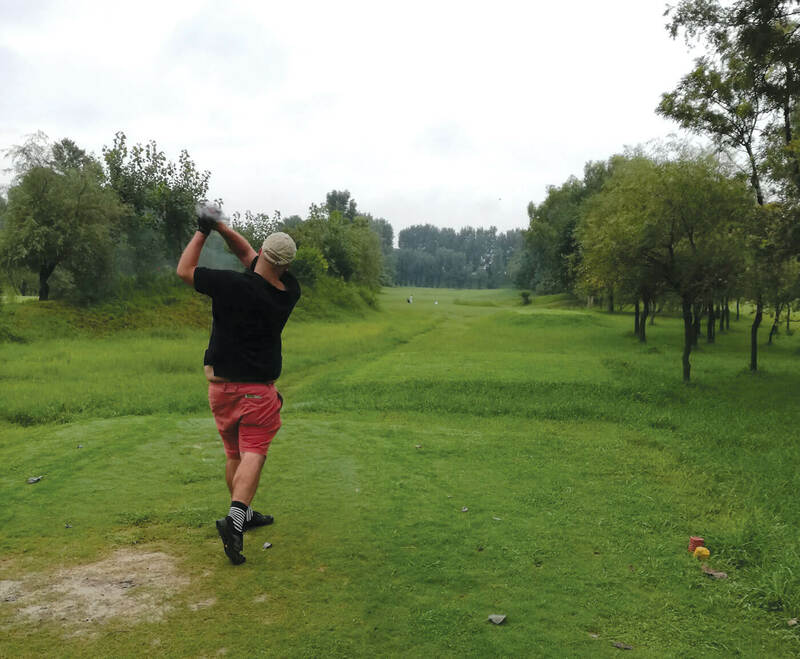 My first experience on a golf course in Nepal was during the monsoon’s humid heat, and it would be fair to say I was a frustrated hacker by the end of the round. Not only are the courses in this wonderful country exquisitely difficult, they are even harder and potentially more hazardous during monsoon. The key to enjoying golfing in the rain is being prepared, using common sense and timing it right. Seasoned players are in the habit of waking early to beat the heat and rain, while some play later in the day. But because it rains mainly at night, the course is soggy in the mornings. The afternoons may be hotter, but they are drier. While the weaker ones resign golf bags to the broom closet during the monsoon, those playing continue to improve their games. 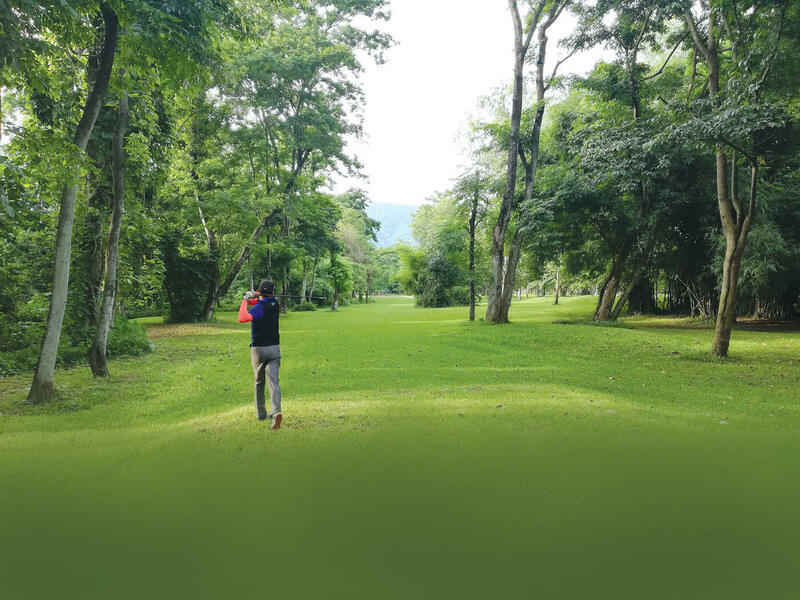 Just visit the Royal Nepal Golf Course in Kathmandu on Saturdays, Sundays or Wednesdays, to see the vibrant culture continuing through the dreary months. Teeing off at 7am, troops of Gurkhas take to the course for their rounds to beat the heat and, on Saturdays plenty of young aspiring golfers take to the range to hone their swings. The best-known courses in Nepal, Royal Nepal and Gokarna Forest Retreat, are unique, but there are three other courses in Pokhara, Dharan and Devachuli. Having played in four of these to write this review, it is fair to say each has its own challenges and charm (see map). The balls plug into the turf, but courses typically allow for placement and cleaning of the balls. It is a hassle many have to contend with and getting the ball to run down the fairway is almost impossible. With impromptu and intermittent downpours, those who are game should pack a rain jacket and umbrella, and a pair of waterproof shoes. There is also a lot of long grass in the monsoon, which makes the stakes of the game a little higher as the pressure to hit the perfect shot is even more important. Even still, it’s sometimes hard to find the ball on the fairway. 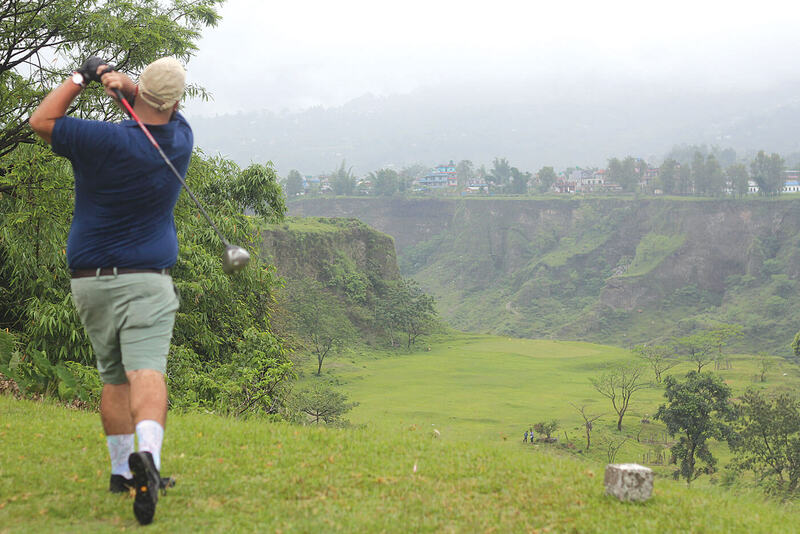 During high season, the Himalayan Golf Course in Pokhara offers stunning views of the Annapurnas. During monsoon you play among few, if any, other players. Hitting over rivers and gulleys, shooting blind over trees and across the Bijaypur Canyon, the course is stunningly vertiginous and there is plenty of cover when Pokhara’s legendary rains come pouring down. Billionaire Binod Chaudary’s personal course in Devachuli of Nawalparasi opened to the public eight months ago, and is as well kept as Gokarna Forest Resort. The short 9-hole CG Retreat course is arguably the most forgiving of Nepal’s courses, with plenty of clear ground for mishits to fly, and has some of the best greens in the country. When it rains, however, it is a different story, and thankfully there is a spa and gym to keep you occupied. The heat, while it might seem unbearable to some, is really quite temperate in comparison to tropical southeast Asia. 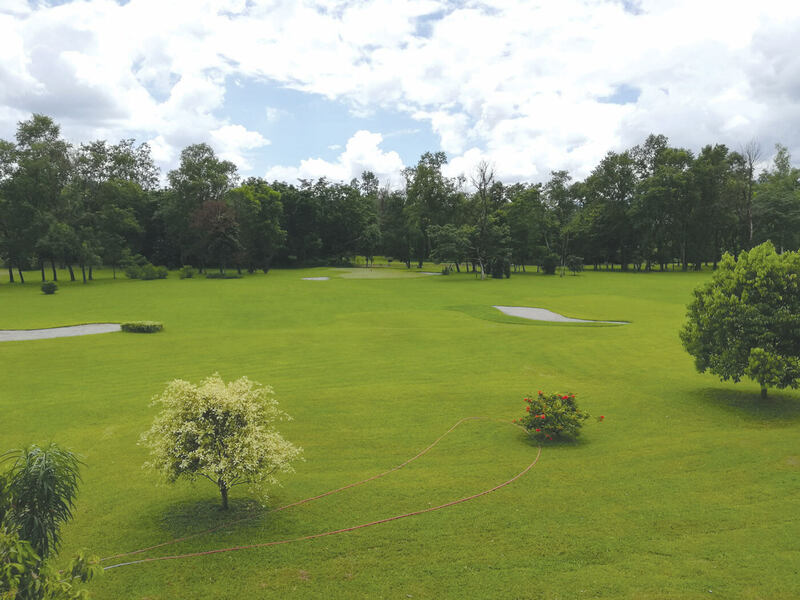 Gokarna Forest Resort senior golf director Deepak Acharya believes Nepal’s relatively temperate climes, even during monsoon, makes for a potentially lucrative attraction. “But you need to have a product that will actually get you to stay one extra day or night in the city, but we are not catered to do that. 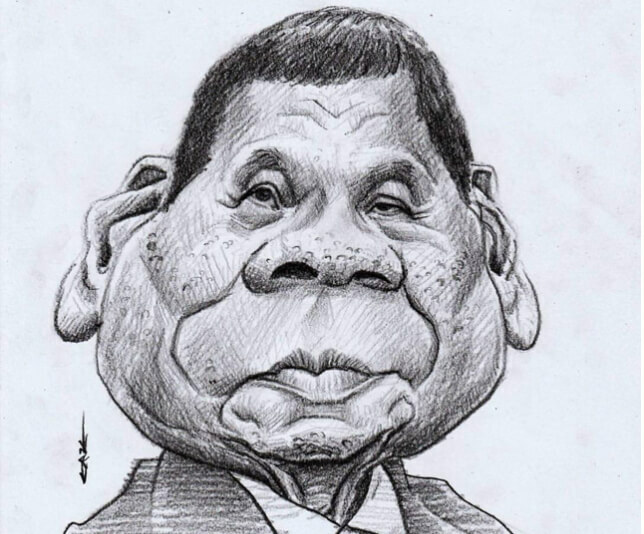 We need to put our heads together, because we have the potential,” he says. Indeed, golfing in the monsoon could be an attractive package for golfers from the Gulf who only have sandstorms for excitement. 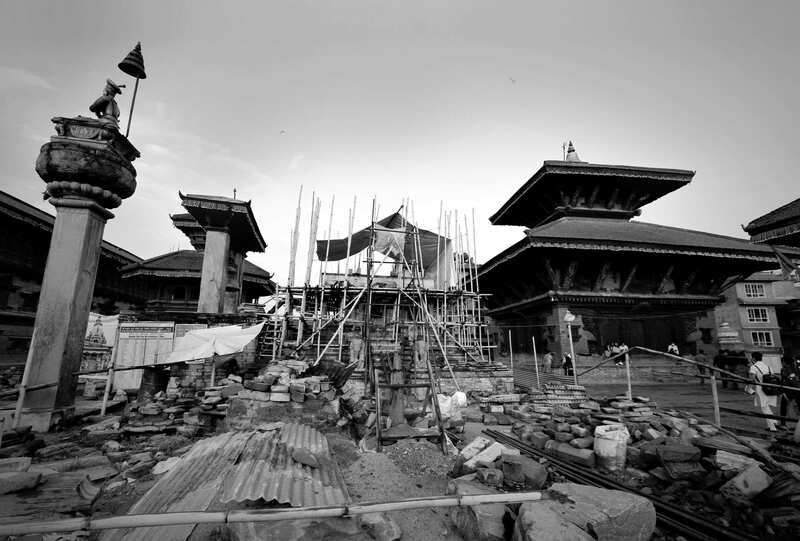 It is just a matter of time until not only Nepal twigs, but the rest of the world does too. The most unfortunate thing about golf, but what makes it great, is that we must play to the conditions. In Nepal, the US or Europe, rain or shine it is well worth being out there no matter how pitiful the score. It is going to be our fault for not being out there or not scoring well, just don’t blame the weather. She has met golf great Tiger Woods and played at some of the best courses in the world after gaining international media attention. ESPN featured the young golfer in a dedicated documentary: A Mountain to Climb. The 18-year-old golfer, having grown up in a shed on the third hole of Royal Nepal Golf Course, acknowledges it’s been a crazy year. Back in Kathmandu, the self-assured yet self-effacing Sherpa continues to work hard on her golf and schooling in hopes of making a career in the game. The goodwill of the Nepal Golf Association, and several others, has seen her kitted out and benefiting from a good education. On a rare afternoon off training, she sits outside her home on the third hole and reflects on the past year. 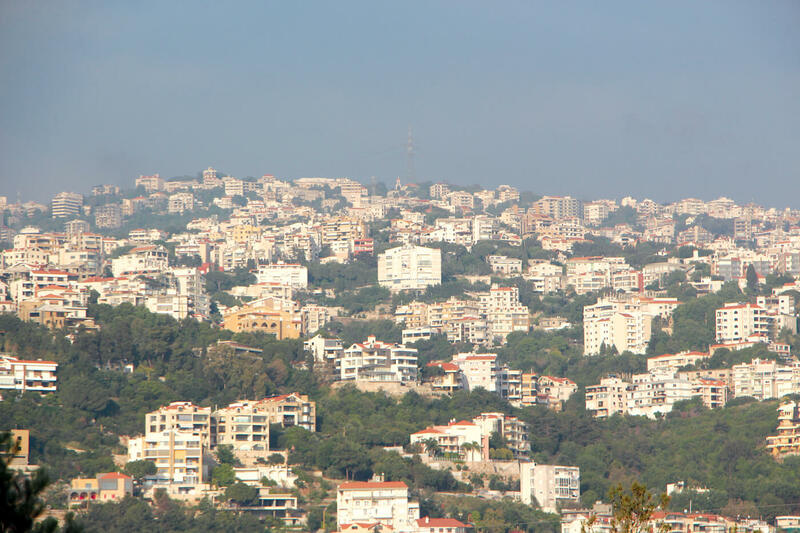 She has gained attention from golfing greats, touched by her story, and is now working hard to do well in her TOEFL and SAT exams in three months time, having been encouraged to apply for a Fulbright Scholarship to pursue higher studies in the US. “It’s a great opportunity, for me and the upcoming ladies,” she says. In October Sherpa is travelling to speak at the ESPN Women + Sport Summit in the US. To lower her handicap by 5, to become Nepal’s first female pro, she is focusing on her course management – a piece of advice from Tiger Woods himself. “Nothing’s impossible. It’s difficult, it’s not impossible,” she says. And, if all goes according to plan, Sherpa wants to come back to Nepal to continue feeding the burgeoning game. There are many young people striking the ball well, however, not just Sherpa. Sachin Battarai, her coach, says there are eight determined girls playing at the Royal Nepal Golf Course, and there is plenty of talent in the ranks. Among the best are Prativa Rai, 17, Kashmira Shah, 18, and Bhumi Banaya, 15. Sherpa says she hopes there will one day be enough women serious about the game to justify a women’s tour. She also hopes to represent Nepal at the Olympics one day. There are many young men making a go of the sport as well. Nepal Golf Association’s Deepak Acharya says many underprivileged young golfers are coming through the ranks. Every Saturday, the courses host youth development sessions for them. 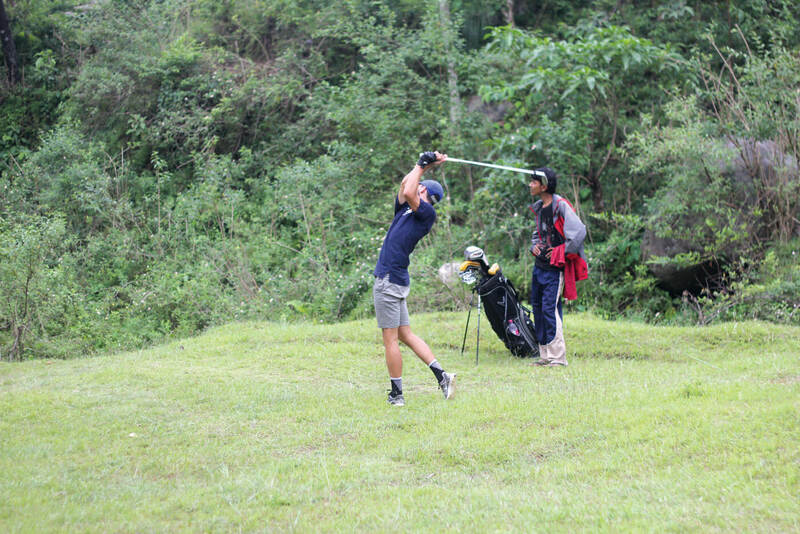 Typically Royal Nepal Golf Club hosts about 40 young players, while Nirvana Golf Club and Resort, Himalayan Golf Club and Gokarna host 10 players each. One such player, 20-year-old Sukra Bahadur Rai, has shown both willingness and talent. NGA has helped him further his education, like many other young golfers–. There are plenty of golfers hitting the range in the hopes of making a career out of the sport. Names to look out for will be Binod Tamang, 15, Subash Ghising, 15 and Bipin Tamang, 19. Rai scored himself a place in the top 10 at the Thailand Amateur Open last year, while Tanka Bahadur Karki won the Bhutan Amateur Open recently. Both these players were found through the NGA’s youth development programme, and there is obviously more talent to come. Considered among the most unique courses in the world, it currently has 16 holes. Par-73 over 18 holes (players play the first and second twice) it was opened in 1994. The course is vertical, and built in a valley of the Bijaypur Khola 80m directly below the clubhouse. Opened to the public eight months ago, this was used as a private course of billionaire Binod Chaudhary. Located in an Industrial Park, this 9-hole course (par-64 over 18 holes) is maintained to an exceptional standard. 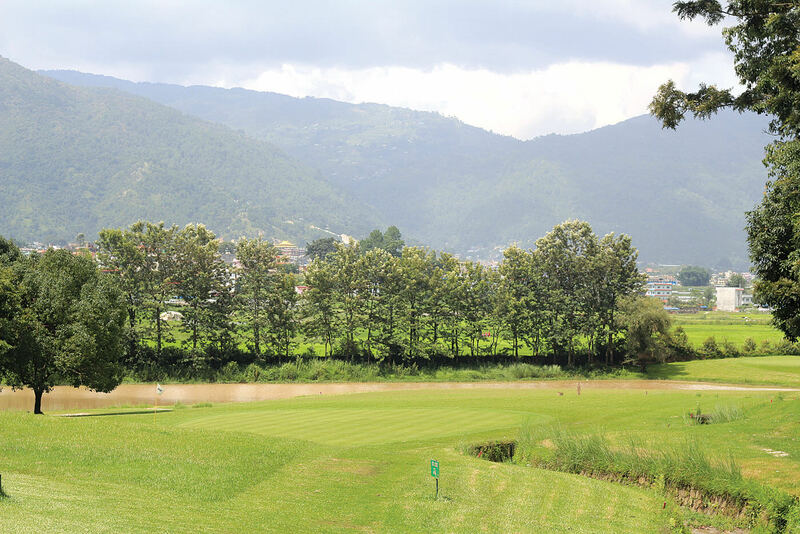 Located adjacent to Kathmandu airport, this course may be only nine-holes but is challenging with plenty of hazards. However, there are some forgiving holes, the caddies have a good knowledge of the terrain and there is a vibrant member culture. Ten km from Kathmandu city centre, this well-kept par-72 course offers a varied 18-hole experience. Part of an ancient native forest and opened in 1999 at a former royal hunting resort. It has plenty of water hazards and some of the best putting greens in the country. Warning: bad roads to get there. 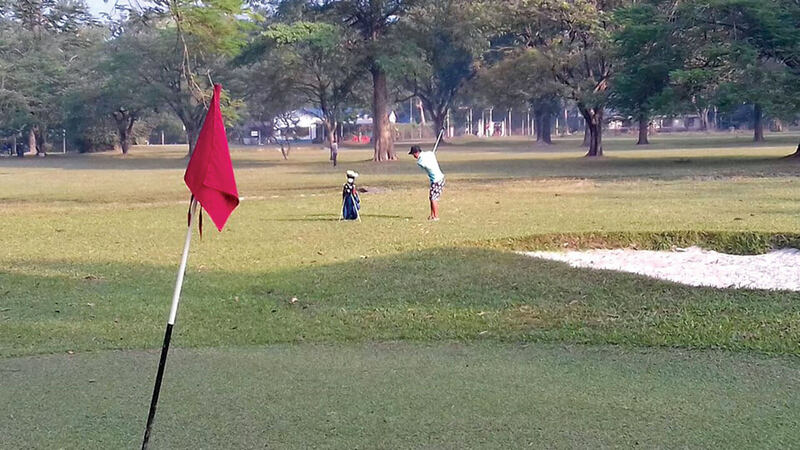 Forty-five minutes from Biratnagar Airport, this 9-hole course in Dharan was built at a former recruitment and pension base for the British Brigade of Gurkhas in 1962. The course is par-70 over 18 holes.